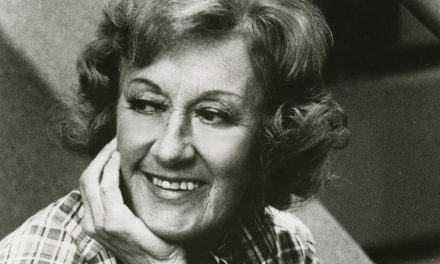 Pianist Margaret Marian Turner (Marian McPartland) was born March 20, 1918 in Slough, United Kingdom. She originally learned piano by ear (not having lessons until she was 16) although she had formal lessons as a violinist and singer, neither of which she pursued. Although during her studies at the Guildhall School of Music and Drama in London it was expected that she would become a classical pianist, McPartland instead preferred jazz and in 1938 joined Billy Mayeri’s Claviers, a four-piano act in vaudeville. During the war years, she worked for the Entertainment National Service Association and by 1944 the USO. She met cornetist Jimmy McPartland in 1944 and soon joined his sextet; they were married in 1945 and she moved with her husband to the U.S. in 1946. The McPartlands worked together during the second half of the 1940s, primarily playing Dixieland in Chicago before relocating to New York in 1949. A modern pianist, Marian McPartland began working with her own trio in 1951, first recorded as a leader for Savoy, and was based at the Hickory House during 1952-62. She continued her solo career in the 1960s and ‘70s, divorced Jimmy McPartland in 1972 (they would remain friends), hosted her first radio show in 1966, and became involved in jazz education. During 1979-2011, she became as well known for hosting the NPR series Marian McPartland’s Piano Jazz radio programs as she was for her still-adventurous and modern piano playing.